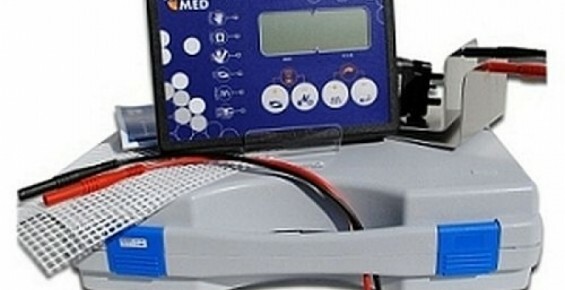 Hidrex PSP 1000 is one of the most well known models of iontophoresis device used by hyperhidrosis patients. 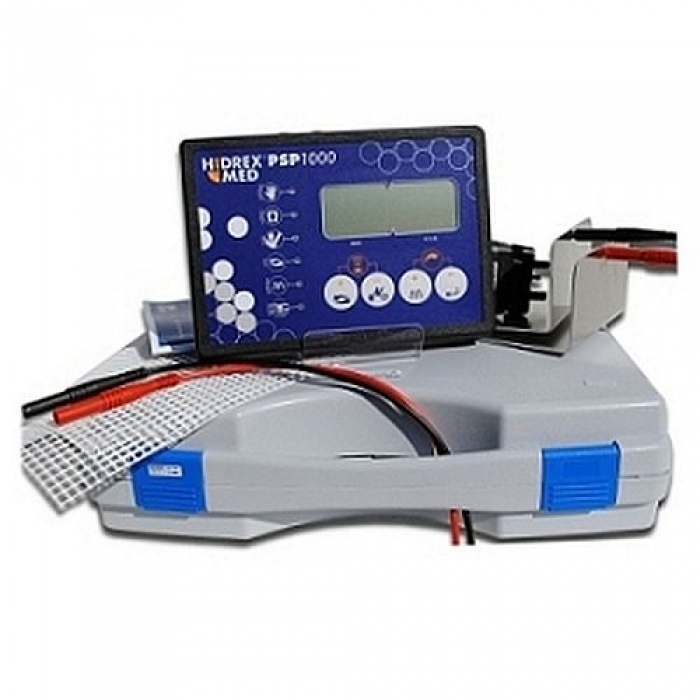 The Hidrex PSP 1000 is a mains powered, pulsed current iontophoresis device. The device can swith between pulsed and direct current. Pulsed current treatment is recommended for treating areas that are traditionally more sensitive, such as hands and underarms. The current flow is adjustable and the Hidrex PSP 1000 device comes pre-programmed with settings for optimum results and ease of use. 1 x Hidrex PS500 switchable pulsed & direct current contol unit. 1 x Electrode plates for treatment. 1 x Pair of 4mm electrode connection cables. 1 x AC 110v – 240v power adapter. 1 x Combined carry case & treatment tubs. Manufacturer 2 year warranty on control unit. Have you tried Hidrex PSP 1000, or know someone who did? Let everyone know how did it go – please write a quick review on Hidrex PSP 1000 by clicking the button below. Hello,I am a 25 year old male from UK and have suffered from what I considered to be mild localised palmar/plantar hyperhidrosis all my life, although I get extremely excessive general sweating and facial blushing when taking part in intense exercise. The sweating of my hands increases markedly on contact with any kind of surface. I've previously tried strong antiperspirants on my hands and feet but it produced unsurprisingly poor results.My first impression of the Hidrex PSP 1000 was surprise at the lack of included information on treatment protocol, such as the suggested treatment parameters (mA/voltage) and the effects of the various pulse widths of the pulsed current feature. Most of the instructions seemed to be a poor translation from German to English.I've treated my hands on Day 1, 2 and 4. I've used a pulse width of 70% at 35 Volts, which I believe maxed out the current limitation feature of the device because when I tried to experiment and up the voltage to 40, the machine would not increase any further than 35. When switching the display to mA instead of Volts, the treatment seems to max out at 11-12mA (with pulse width of 70).The above settings produced a pretty strong tingling feeling, close to the point of irritation. My hands are now sweating more than when the treatment began.I live in a mid/hard water area by the way and I've alternated the anode and cathode for each treatment so far - I know some places advocate keeping the same polarity for initial treatments, but I don't see the logic of this given that if the true mechanism of the treatment is to drive ions to block the sweat glands, then surely it would only work on the hand in which the ions are being driven into the skin, not out of the skin.Is there something I am doing wrong or something that anyone would advise that I do differently e.g. current/voltage and pulse width, treatment times etc.Thanks! The only downside is that I found Hidrex PSP 1000 inadequate for treating underarm excessive sweating. Iontophoresis for sweaty hands with Hidrex woked blissfully well, but when it comes to underarms, even with applicators I couldn't get the best results. Maybe iontophoresis just isn't cut out for treating underarm sweating? I don't know. All in all, this iontophoresis device on its own is a very nice machine, maybe a tad expensive, but for hands it provides excellent service. I would recommend it if you suffer from palmar hyperhidrosis (and plantar hyperhidrosis), but I wouldn't be quick to recommend it if you only suffer from axillary hyperhidrosis. Very good choice of iontophoresis machine, Hidrex PSP 1000 actually surpassed my expectations. After reading all the reviews here, I decided that this is the best fit for me, and it really was! I've been using it for 3 months now, at first 5 times a week, and now only twice a week. Excessive sweat got worse for a while during my initial iontophoresis treatments, but then it rapidly started to improve, and now I feel better than ever. The Hidrex PSP 1000 device itself is very cool, very easy to use, and definitely among the best iontophoresis devices out there! Five stars worth, and definitely recommended! The whole set is delightfully well made, with durable tubs and plates that look like they will last. The setup and use are comfortable and it's easy to run the treatments and pack up everything once you are done. My feet are drier now, but my palms still sweat noticeably (but it is less than before!) I'll do my best to vary the current and the pulse width and hopefully the results will improve soon. 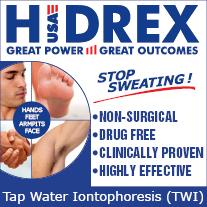 I ordered Hidrex PSP 1000 Full Iontophoresis System, with additional trays that let me treat hands and feet at the same time; and I also opted for sponge pads for my underarms. To my great delight, iontophoresis helped me reduce sweating in all problematic areas of my body - my hands are now completely dry, my feet barely ever sweat, and my armpits sweat only when I'm really overheated. In my experience, the best thing about PSP1000 is its duality (pulsed/direct current). Thanks to this I could set the intensity to be strong enough for my feet (I use DC for this), and mild enough for my underarms (weak PC). This is probably why it worked so well. It took me some time to go through the manual and figure out all the advanced options, but today I'm thankful for them. It feels as if everything can be custom-set and I don't struggle to achieve the right current properties. In the first weeks, sweating from my palms was even worse than usually, but this was only temporary and after a month my sweating started to weaken. I take treatments twice a week for optimal results and my hands and armpits are sweat-free. My settings sometimes vary as there are days when I feel more/less sensitive to the current flow, but I always use weaker settings for armpits. My 16-year old son and I are using this device and it has helped us overcome problems with excessive sweating. I would recommend it if you are looking for a safe therapy - and by safe I mean something that doesn't use medications and doesn't leave permanent side-effects. This seemed like the best choice for my child and it has helped him to engage more in sports activities and to have a better social life. I had some problems getting him to use the equipment as he can be restless, but a few weeks into therapy he started to love it. His sweaty palms and feet turned practically normal. Unlike him, I have sweaty palms and head, but only using this for my palms. The device works perfectly, I'm only giving it a 4-star rating because of the price. A true 5-star iontophoresis machine. I upgraded to this from another Hidrex device and I am very happy with my decision. Being very sensitive, I can't stand intense current, but Hidrex PSP 1000 does wonders because of its highly adjustable pulsed current. I started with a weak pulse-width of 55% and was slowly raising it as days and treatments went by. Now my ideal options are 80% pulse-width for feet and 75% for hands, but I often do small adjustments to get the best results. I like the fact that everything can be programmed in advance - this way I can just place my hands in the trays while the device goes through the treatment automatically. Also, I recommend stainless steel electrodes as they are easier to clean; and you can use Current Care lotion if your skin is sensitive. P.S. 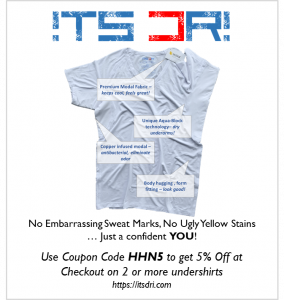 It took me over a month (maybe 5-6 weeks) to reduce sweating to a minimum, normal level. It worked on my hands and feet perfectly, and to keep it that way I use the device 2 times per week: once for feet and once for hands. I bought Hidrex PSP 1000 a month ago and started using it about two weeks ago, so I am still waiting to achieve perfect results. My palmar hyperhidrosis is not yet cured, but the sweating is visibly reduced. I have tried out different settings and it seems that a pulse width of 60% at 30V is the best for me; and the treatment works well with regular tap water. So far I've had treatments every other day and I'm about to switch to the maintenance schedule of one 25 min treatment every 5 days. I must say that my hands roughened up due to treatments, but a simple hand lotion applied after iontophoresis helped me deal with this. In the future I plan to use Hidrex PSP 1000 on my underarms as well, and I hope my skin will endure it.